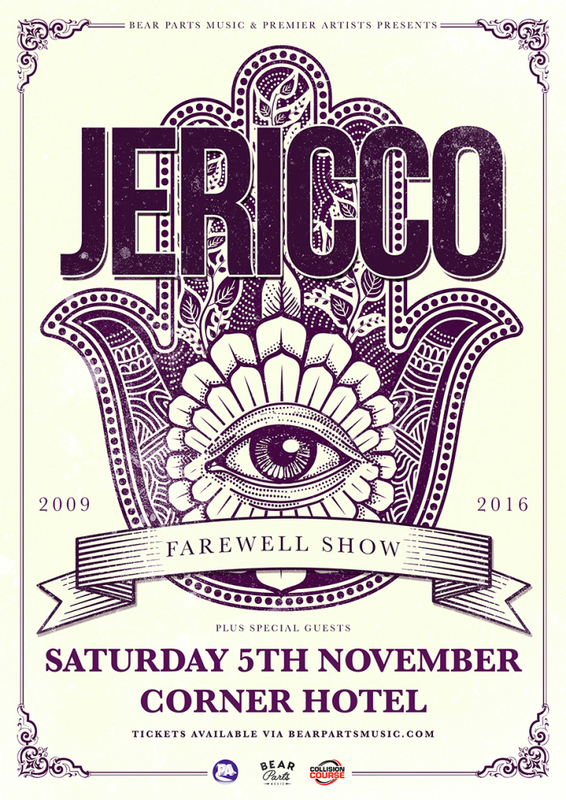 Melbourne’s Hard Rock/Alternative crew Jericco, a long-standing and well-respected member of a famously-awesome Melbourne Rock scene today announce their split and their final ever show. The band have always wanted to headline Melbourne’s iconic Corner Hotel and they have locked down November 5th as their final show ever. It is a fitting and awesome end to a band who brought a huge live show to the stage and massive tunes to the Australian rock scene over the past 7 years since 2009. Supports will be announced closer to the show date, but this is the farewell for the beloved band. In a statement from the band on their facebook, vocalist Brent broke the news. “It’s been a long and awesome journey for Jericco. Over the past 7 years we’ve played with 3 drummers (Luke, Matt & Aiden), 5 guitarists (Brian, Jordan, Adam, Kris & Anthony) and a keyboard playing manager (Fetah). Each and every person who reads this would have and still probably has a connection or memory with one or more of the past members of Jericco. Even though they won’t play in this final lineup they will always have a place in our hearts and yours. After 2 EPs, a live album, 2 full-length albums and countless tours and shows across our beautiful country – we have decided to call it a day. It’s such a strange feeling making this decision, as our band and this amazing group of people have been our life and our family for so many years. We put everything we had into Jericco and we made sacrifices that affected our families, friends & partners. Running an independent band takes its toll emotionally and financially and every member we have had past and present have offered everything they had without question. They put it all on the line. We, Brent and Roy, as the remaining original members are and will be forever grateful for that. We are all brothers & always will be. There is nothing about the journey of the band that we would change if we had our chance to do it all again. All the decisions we have made over the years, some good, some bad, we stand by. We stand by the songs we wrote because you ain’t got nothing without your songs. You also ain’t got nothing without your fans. For an independent band with the odds stacked against us, we had such a committed bunch of fans – which is why we kept doing it. We knew people out there wanted us to and we would see all the same faces at our gigs that where there from the start. It’s those fans that came to show after show, the ones we recognised and the ones we had beers with and the ones who sang along, that’s what made it so special and so hard to give up. Brent always said that if we get more than 10 people at a show then we won and in 7 years we won every time. Keeping the band together is simply not possible – we all have this beautiful thing called life happening around us and to us. We are going out happy and on our own terms. We are not going to thank everyone by name so that we don’t leave anyone out. You guys know who you are. Even if we name you all, words will never be enough to say thank you to our friends, fans, sound engineers, bands we’ve toured with, bands who have inspired us, industry colleagues, booking agents, producers, tour managers, mentors and our families. We will be playing our last show at the Corner Hotel in Melbourne on Saturday the 5th of November and we hope to see you all there, for one last time..